Everyone expected Red Rosie so at least they're getting her out the way first. It seems Bachmann is going to keep milking existing toolings in the HO range for a long time. Maybe someday we'll get a new engine, but it seems less and less likely each year. If they bring the Mainline Hopper into the range, I'd be surprised. N Scale is unexpected, but honestly not a surprise; there were several discussions made about N scale Thomas being made last year, and a lot of people collected the Tomix Thomas range recently, so Bachmann must see a potential market there. If they end up using the Graham Farish wagons though, I'd be disappointed as they'd be much smaller scale compared to the Tomix toolings. As for the Flat Wagon w/ Logs; here's hoping it's the former Flatbed w/ Paint Drums tooling, and not the RF Container Wagon or Well Wagon toolings by accident... Logically, it -should- be the former hopefully. Hopefully when the catalog goes up, we'll know for sure of everything. The new Christmas set was confirmed to come with an open wagon with present load, similar to the large scale one. One other thing I think I am going to do is, apart from Gordon, hold off on all the N scale projects I have planned until I see what the new Bachmann lineup will be like. I’m wondering if the troublesome truck toolings will either be a new tooling or if they are going to reuse the graham farish wagon tooling. Oh ok. That's too bad. Seems like a missed opportunity if you ask me but whatever. Going by Cheeky ULP's, if those are the designs for the HO wagons then I'd be happy especially because they come with loads. 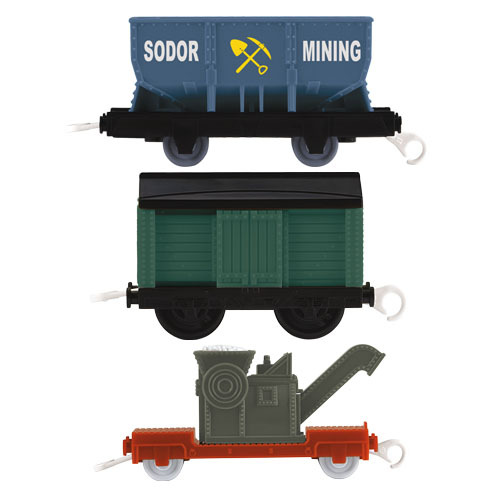 While I think the Mining Car might be the red one from WR, I really hope it's instead based on the green Trackmaster hopper. Hopefully the N Scale line is all unique toolings. 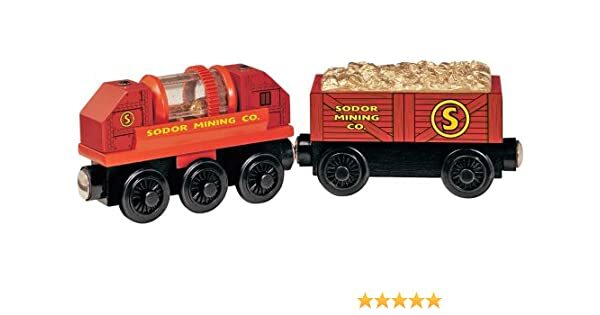 Does anyone think the Sordor Coal Co. wagon will replace the regular coal truck? I hope not considering the coal truck is the nicest of the available open wagons in my opinion. Considering they get the fuel tanker and the Sodor Diesel company have been put at the same time, I think it’s possible they would keep both. 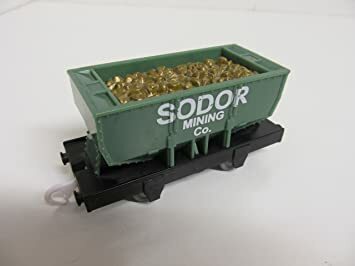 Personally I would be interested if the mining car was the mainline hopper repainted. Now I’m more anxious to see the catalog. Does anyone know when the catalogue will be out on digital form? Alright. Time for my thoughts on this year’s announcements. I’ve seen a lot of people say that we didn’t get Troublesome Truck #6 this year, but honestly I can see why. I’ve noticed that after Truck #4, we’ve gotten a new piece of rolling stock with a face every two years. So yes. The Spiteful Brakevan counts as a Troublesome Truck. I’m guessing that we get Truck #6 next year. I was betting that we would get a flatbed rerelease and we got one! I’m a very big fan of the flatbed and seeing a new one with a new load excites me. I just hope it’s the same grey as the original with Paint Drums, and not some green with logos and stuff. Just plain simple grey. I think it’s nice we’re getting some more open wagons (considering the last one we got was Truck #4) and I can’t wait to see what they look like. I’ve been wanting a scrap car for a while now. Just so it can go with Arry and Bert. The coal car is another good idea because there was only one coal car up until now. The mining car will be interesting. I don’t really have any guesses as to what it will look like. I’m still a bit disappointed we haven’t gotten a dynamite car yet. They could just base it off of the large scale version with the ice cream van. I have no comment on the new Christmas set. The N scale range was a huge surprise to me, and I’m excited as to how they’ll cover that. Everyone’s been saying that this has been the most disappointing year of announcements yet. Personally, I thnk we'll get something good next year. Now we’ll wait for 2020. Rosie as the new engine is a bit disappointing, would much rather have a brand new character, don't even mind Sidney being made. The Trucks are great choices, quite hard to mess them up, the log flatbed is cool, I really wanted to see Hector and dusty rusty truck. I guess this could be a cheaper year for me, as I got most my engines since Christmas 2017 (Edward, Henry, James, Percy, Toby, Duck, Donald, Douglas, Oliver, Bill, Ben, Spencer, Rosie, Diesel, Mavis, 'Arry, Bert, Paxton. Already had the Thomas, Salty and Emily. Do you plan to get Red Rosie? I plan to get her since I don't have Rosie at all yet so like Grumpy Diesel, I'll just get the new one instead of the old one. I'm interested to see if anyone who already has Pink Rosie will get Red Rosie either to replace it or just to have both. I know that the Rosie fans on Twitter will buy it. I only hope we'll get an actual character next year in 2020, even if it's another recolor character like Sidney. Well red rosie I did see coming however I wasn't 100% sure if it was going to be this year or next for her. As someone who doesn't have rosie I will buy the original and red. Wonder if red rosie will have her lamp. That will be intresting to see. The rolling stock I'm very excited for the sodor logging company flatbed with logs. That sounds great. As does the mining wagon with load. I like loads. Intresting they put (blue) beside it. Maybe foreshadowing for next year. Scrap wagon probably like the hornby one. That's all folks, until 2020, as InsideTrack has spoken, and made clear. Not a single new announcement for Narrow Gauge, but on the bright side, we still have Rusty and the Narrow Gauge Coaches to look forward to. Theoretically, Peter Sam COULD be in the works, but Bachmann didn't feel it was the right time to announce him yet, so if they finally announce him next year, it's possible he could be well into production already, and released by the end of 2020. Skarloey was worked on since at least 2014, and he was announced in 2015, then released in the holiday season of that year. Once Rusty and the Coaches get released this year, absolutely nothing will be on the backburner for Narrow Gauge, so Bachmann must have big plans regarding Narrow Gauge in 2020. We knew Red Rosie was inevitable for HO Scale, especially since Bachmann already had the tooling. Out of all the predictions many of us have been rapidly posting throughout the past few months, Red Rosie and the reintroduction of the Flatbed were the ONLY predictions to actually come true. I'm shocked that there's still no HO Explosives Van, but we're getting more open wagons, even a couple loaded. I bet many people are glad Sidney wasn't announced because now, we're not getting a Class 08 on three consecutive years. Bachmann decided to reuse an engine tooling that isn't Diesel's, to help break the monotony. I don't hate Sidney as a character, but I'd still like to see him get announced someday in the future. Next year will be the 75th Anniversary. I think the BEST idea for a recolor to celebrate it would be Green Thomas from The Adventure Begins in HO Scale. For the 70th, we got Celebration Thomas, which nobody cared about, but Thomas in his original LBSC livery would sell better. It's about time we're getting N Scale Thomas models from Bachmann. I'm glad we're getting at least two engines to start it off, which are of course, Thomas and Percy. I highly doubt N Scale is going to suffer the same fate as Large Scale because N Scale is much smaller, and should definitely be more affordable. It will be an answer to those who wanted better models of Thomas and Percy. They might cost around the same price as HO Scale models. Unlike the first HO Scale models, which were based on cartoon illustrations, the N Scale models will be based on their CGI models, so we'll finally have CGI Thomas and Percy in a tiny size. Next year, James is inevitable, especially if the N Scale range takes off like the Skarloey range did. We should FINALLY get tender engines again. Maybe even N Scale Gordon at last. Bachmann shouldn't have anywhere near as much trouble making the big engines in N Scale as they would in Large Scale. Yes, I'm considering picking up the N Scale models once they're available. As for O Scale, Lionel still holds the license. Bachmann might consider making O Scale Thomas models if Lionel ever surrenders the license. Now that Hornby has dropped their license, Bachmann might eventually release their HO Thomas models in the UK. I knew things were looking bleak for Large Scale. I'm not surprised nothing was announced there either. Sorry I'm going to double post here, with the N Scale engines, I guess their eyes will not be moving? Just like the Narrow Gauge models, the N Scale models will not have moving eyes, since they're too small to have that. I might be interested in the freight cars. But to be honest I was too disappointed in this years line up. I need to see these truck repaints before considering to buy them. Although I do model N Scale. It came as a big surprise and disappointing that was no narrow gauge. Last year around November I was thinking of buying those Tomix Thomas freight cars and maybe with Thomas/coaches set. I was told to not get them because it will the same way with the HO ones I have. 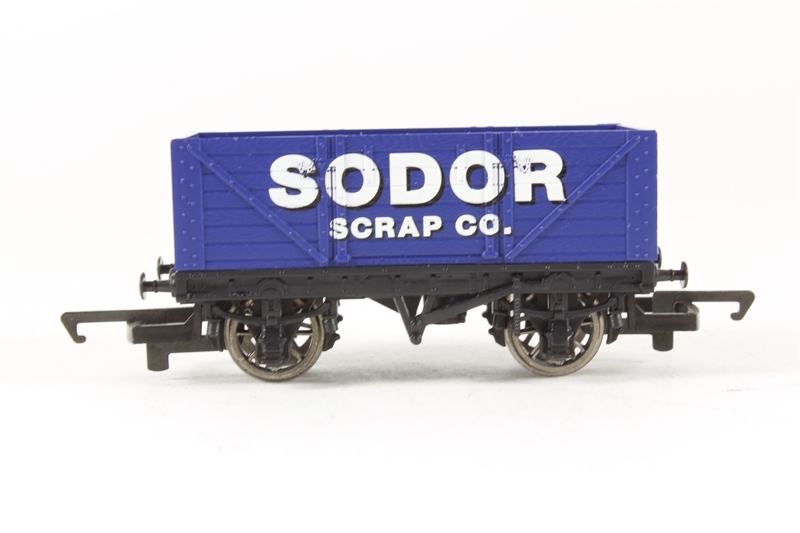 Plus the Japanese models didn't have a brake van. I wondered the same idea in my head if Bachmann would make the brake van for their n scale line. Or not make one at all making their goods trains incomplete.